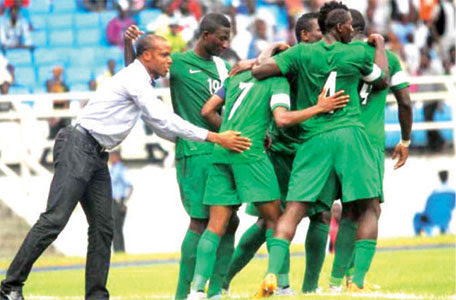 Nigeria’s senior national team Head Coach, Sunday Oliseh, got his first victory in-charge of the Super Eagles yesterday with a 2-0 result over Mena of Niger Republic in an international friendly at the adokiye amesimaka stadium in Port Harcourt. The two goals scored in each half of the game by Ahmed Musa and Moses Simon restored smiles to the face of the former Ajax and Juventus player who got his baptism on the Eagles hot-seat with a barren result against Tanzania in a 2017 Africa Cup of Nation qualifier. Clearly, Eagles were better spectacle in Port Harcourt than the below par performance against the Taifa Stars in Dar es Salaam. The victory has however not signify the arrival of the three-time African champions as they still lack quality in almost every aspect of the game except in the goalkeeping role. Team captain, Ahmed Musa, fired Nigeria into the lead as early as the 11th minute from the penalty spot after goal-bound Anthony Ujah was brought down in the box by Issiakou Koudize. Simon who was a thorn on the flesh of Mena defenders was to rise up to the occasion of sealing victory for Nigeria with the second goal with just five minutes to end of regulation time. A Nigerien defender had rifled a clearance into Simon’s path just within the backline area only for the Eagles left winger to lap the gift with a thunderous kick that beat Daouda Kassaly in goal for the visitors. Oliseh’s men who had the game under control should have gone two goals up when Usman Mohammed played in Ujah, but his long range shot was parried away by Kassali. Kafi Dan Kwae eventually gathered the loose ball and his goal-bound effort was hacked off the goal-line. The visitors equally had a brilliant moment that would have canceled out Musa’s advantage for Nigeria when Mohammed Wonkoye flunked a clear chance in the 28th minute. He was a gem in the attack of the Mena. Russia-based winger Amadou Mountari was also outstanding as he kept Solomon Kwambe on his toes until the Warri Wolves ace was replaced late on. Nigeria’s Wolverhampton Wanderer’s goalkeeper, Carl Ikeme, again had a decent outing like he did against Tanzania last weekend. However, Eagles top striker, Emmanuel Emenike’s goal drought continued as he fired blanks in his second game under Oliseh. 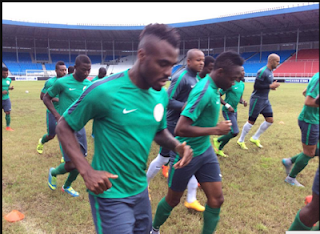 The last time he scored for Nigeria was in 2013 against Ethiopia in a World Cup qualifier. Emenike battled in vain to break the jinx but the goal he scored in the 75th minute was adjudged correctly by Ghanaian referee, Daniel Laryea to have been fired from an offside positioning. Sunshine Stars’ Prince Aggreh missed a clear chance to enter the scorers’ sheet when in the dying moments of the match was not decisive enough inside the Mena’s six-yard box to put the ball into the net.